For this year’s Weekender, our annual professional development programme, we hosted 20 teams of filmmakers developing bold, brilliant genre projects that all have something to say. Jack is Events Coordinator at BFI NETWORK. When it was announced recently that Jordan Peele’s mega-hit Get Out had been submitted for the Best Motion Picture – Musical or Comedy category at the Golden Globes, the outcry spread far and wide. More accurately defined as a horror, a thriller, or, as Jordan Peele himself wryly suggested, a documentary, Get Out is a shining example of the way that genre conventions can be utilised to make bold, urgent statements about the world we live in. Further, by grossing $250 million to date, and toppling The Blair Witch Project’s 18 year reign as the highest-grossing first feature based on an original screenplay, it proves that audiences are hungry for smart, boundary-pushing genre filmmaking! With this in mind, we’ve spent a lot of time thinking about how genre filmmaking can be a brilliant way to announce new cinematic voices. Whether by making an audience howl with laughter or jump with fright, sometimes a thriller, or a rom com, or a ghost story, or a full-blown slasher, can be the perfect medium for a first feature that breaks through and becomes a hit. And so for this year’s NETWORK Weekender, our annual professional development programme and one of the centrepieces of our year-round calendar, we decided to invite 20 teams of filmmakers developing bold, brilliant genre projects that are reinvigorating oft-maligned formats, and that, most importantly, have something to say. As our 35 participants from across the UK gathered in London, the Weekender began with a masterclass from the Academy Award-winning producer, Iain Canning. Iain gave incredible insight into the formation of See-Saw (the production company he co-founded with Emile Sherman) and the way he works with emerging filmmaking talent, alongside brilliant practical advice across development, finance, production and distribution. Perhaps the most important lesson that Iain taught us spoke to the journey from script to screen: you must mourn the film you thought you were going to make, and begin to love what you’ve shot on its own terms. Up next, king of the box office Charles Gant (Screen International) assembled a stellar panel of industry insiders to explore Genre in the Market. Poonam Sahota (eOne), Hamish Moseley (Altitude Films) Adrian Zak (Virgin Movies) took to the stage to analyse two 2017 releases, both of which relied on and subverted genre conventions. The panel’s insight on selling genre was invaluable, and an important lesson was that every project exists in a market, not a bubble, so it’s important to develop work and budget accordingly: comedies sell with a known lead, horrors don’t need one, and building a story around new talent can be as valuable to a film’s success as an A List-er. We wrapped the first day of the Weekender with a case study of one of the most exciting British genre films of recent years. Babak Anvari’s Under the Shadow is a horror movie set in Tehran in the 1980s, at the height of the Iran/Iraq war. Babak joined us in conversation with the BFI’s Lizzie Francke to explore the making of his film, which, told entirely in Farsi, challenges our understanding of what British cinema can be. Under the Shadow deploys gothic conventions not in a haunted castle, but instead in an Iranian apartment complex, and Babak spoke intelligently about how horror arose naturally from memories of his own childhood and the world in which he placed his characters, as well as the complex production realities of shooting a period first feature set in war-torn Iran! Day two began with an in-depth exploration of Focus Features from its President, Robert Walak. Robert joined Ben Roberts, the Director of the BFI Film Fund, to explore Focus’ impressive slate of genre projects such as Tom Ford’s Nocturnal Animals and Julia Ducournau’s Raw, and how to develop projects with Studio investment in mind. Perhaps the most exciting revelation from Robert was that Focus’ number one priority in working with emerging and first-time filmmakers is finding cinematic voices to invest in, that they’re passionate about, and that they want to bring to the world stage. Up next we were joined by Lydia Hampson, the producer of Fleabag, and Jim Hosking, director and co-writer of The Greasy Strangler, in conversation with the BFI’s Mary Burke, to explore perhaps the trickiest of all genres: comedy. Sometimes seen as the forte of our American cousins, successful British comedies are fewer and further between than other genres, and so we had a lot to learn form Jim and Lydia’s successes. Speaking to why Fleabag resonates so much with audiences both in the UK and internationally, Lydia offered some solid advice on how to make comedy ‘mean something’: it is a brilliant medium to explore dark and serious themes in a way that audiences can access. Jim, meanwhile, discussed the importance of not imposing your own humour on actors, instead advocating that filmmakers work with actors whose comedic style they know and love, and giving them license to find their own version of the humour in the script. But, of course, one of the most essential facets of a successful film, whatever its genre, is the edit. To delve deep into editing, we were joined by Louise Ford, whose credits include Fede Alvarez’ Don’t Breathe, Robert Eggers’ The Witch, and Cory Finley’s Thoroughbreds. Using The Witch as a case study, Louise gave us a fascinating insight into the function of tension in editing thriller and horror projects, where atmosphere is so dependent on what the audience doesn’t see. One important lesson we learnt is that, while you may be inspired by the editing of other films, recreating the edit will rarely work, as each project needs to find its own points of tension, so it is important to find the edit that’s right for the tone and pace you’re trying to convey. 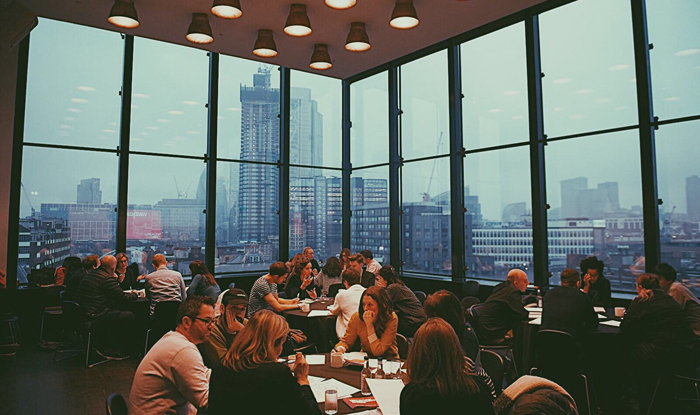 Following Louise’s session, the participants decamped to roundtables for an in-depth examination of their projects, with two teams per table. Joined by a script editor and a BFI or NETWORK executive, this was an opportunity to really scrutinise their projects in the context of everything they’d learned so far, and to get a fresh perspective on their work in an open, collaborative and supportive environment, and to share their ideas with each other. …Especially because day three of the Weekender began in incredible style with Lynne Ramsay and the film’s producer, Jim Wilson, who joined us for a brilliant, insightful and generous discussion of the film’s genesis and production. Lynne spoke about the incredible performance from Joaquin Phoenix, and the value of working closely with an actor to look at a script with fresh eyes and really refine a narrative, stripping away genre clichés to tell an incredibly unique story within the parameters of a convention. After a weekend of thinking critically about genre and its capacity for launching successful careers for strong, exciting filmmakers, what better way to round up the Weekender than with the brilliant producer Andrew Macdonald? Andrew has produced genre hits including Danny Boyle’s Shallow Grave and 28 Days Later, and Alex Garland’s Ex Machina, and joined the BFI’s Lauren Dark to delve deep into his impressive career, and the lessons he’s learned along the way. And finally, it was time for the participants to reflect on all that they’d learned over the weekend – the inspirational insight, and practical wisdom that the speakers shared – and begin to think about how they can apply it to their own projects. The 2017 NETWORK Weekender participants are an exciting, original group of filmmakers that are exploring the world around us through genre conventions, and challenging notions of British cinema. We can’t wait to see more of their work in the future!